Calpak Ambeur is a lightweight hardshell expandable spinner cabin suitcase with TSA approved lock for women. It is offered in four colors of black, rose gold, white and silver and all at the same price. It has a very modern design and is easy on the eyes no matter what color you choose. Calpak Ambeur has a very sturdy and durable thermoplastic hardshell exterior, yet it manages to be very lightweight. If you worry a lot before your flight and you like putting many of your items in your bag and you like keeping your luggage with you at all times, then this great quality and good-looking cabin bag is a nice option to consider. Calpak Women’s Ambeur has the dual spinner wheels that move in all directions very comfortably. With these 360-degree rotating solid spinner wheels and the very lightweight body it is easy to move around the airport or through the narrow plane aisles. It will also fit in the overhead locker bin above you easily on the plane. You can hold it in an upright position and put your tote bag if you have one on top of it. The thermoplastic exterior is resistant to impact and will withstand any bad treatment by the airport staff. You can find the little three digit combo lock on the side of this cabin bag by keeping the zippers together. TSA approved means any TSA staff at the airport can unlock it without having to give any damage to the lock. It weighs only 6.7 pounds and measures 19.75 x 13.75 x 8.75 inches and is spacious inside- is expandable by another two inches and can hold lots of your your stuff. You have the elastic cross straps on one side and a large pocket with a zip-over cover on the other side and both sides are quite deep. All your items will be kept safe and in place on both sides. It will fit in the overhead locker above you even when expanded. The metal telescoping handle is quite thick and has an ergonomic design for your comfort as you can see in the photos. This is a simple design, durable and functional carry-on bag like the other Calpak models, without the extra bells and whistles like an external battery pack or charger. It is durable and should prove to hold up well over time. And although the price tag may not seem to be very low for a cabin bag, we think that you’re getting pretty good value for money. 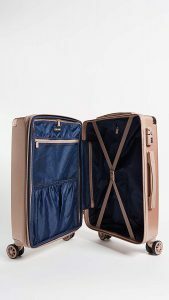 You may want to have a look at the Calpak luggage sets or the larger size options if you need a bit more than what this cabin suitcase offers.